Imagine that astronauts have landed on Mercury - in some distant future. How they would experience a day on this planet? It would be a very long workday from an Earth perspective! This is because Mercury's rotation around its axis lasts 59 days, and it takes 88 days to move around its orbit around the Sun. Interestingly, 59 is exactly 2/3 of 88. This is not by chance - it is an effect of the Sun's gravitational field on Mercury. It is a similar phenomenon that the Earth's Moon always has the same "face"; the Moon always turns the same side towards the Earth. This has a most unusual effect on the length of a Mercurian "day" as measured from noon to noon (note that the word "day" is here used to mean "one daytime period + one nighttime period", corresponding to "24 hours" on Earth). 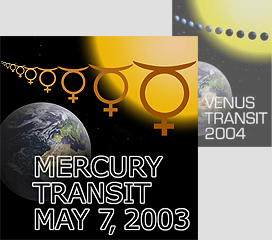 In fact, such a day on Mercury is twice as long as a Mercurian "year" ! On average, 176 Earth days elapse between one sunrise and the next on Mercury - this is therefore the length of the Mercurian day . Since Mercury revolves around the Sun in an elliptical orbit and rotates around its own axis comparatively slowly, the Sun appears to move in a strange way in the sky above that astronaut on Mercury's surface . At some moment, he or she would watch the Sun come to a complete halt. Then the Sun would appear to move backwards for some time before returning to its original position, performing a loop in the sky. Day and Night on Mercury (see the text). Each sidereal day on Mercury last 58.65 Earth days. This means that it takes 58.65 Earth days (or 2/3 of one Mercury year) for Mercury to turn once around its axis, relative to the background stars. Now look at the figures above. They show how Mercury orbits the Sun, while it turns around its own axis. The red marks indicate the same spot on the surface at different times, when Mercury is at different locations in the orbit. Suppose you stand on the surface at that red mark. To begin with, on Day 1 (note that this count is in Earth days! ), you see the Sun at the horizon, as indicated on the left drawing. Very very slowly, because of Mercury's rotation around its axis and motion along its orbit, you see how the Sun moves upwards from the horizon and across the Mercurian sky. On Day 44 , the sun finally reaches the highest point in the sky - it is now "noon" for you. The afternoon begins and on Day 88 , the Sun finally sets. 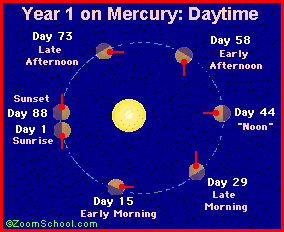 So the "daytime" on Mercury lasts no less than 88 Earth days! After the Sun has set (look at the right drawing), the night falls, midnight happens 44 Earth days later (on Day 132 ), and the Sun again rises after another 44 Earth days on Day 176 . 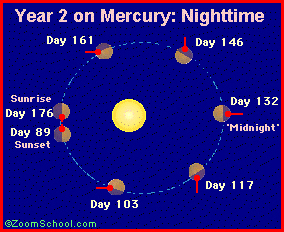 So the "24 hours" on Mercury last two full orbital revolutions, or 176 Earth days! In this sense, one Mercury day lasts exactly two Mercury years ! The length of the day is only one strange effect on Mercury. The exact motion of the Sun in the Mercurian sky and its apparent size is another. Imagine that you stand at one of the two "hot spots" on Mercury's surface, in the Caloris Basin . Since Mercury's orbit around the Sun is quite elliptical, the distance between Mercury and the Sun changes during the orbital motion and the size of the Sun as seen in the Mercurian sky will therefore change dramatically during the "daytime." At the point closest to the Sun, Mercury is about 46 million km away from the central star; in the remotest orbital point, this distance is nearly 70 million km. The corresponding sizes of the solar disk in the Mercurian sky are 1.73° and 1.14°, respectively, that is 3.2 and 2.1 the size of the Sun as seen from Earth. From your location, you would see the Sun rise small and then grow in size as it moves to the overhead position. Moreover, because Mercury moves faster when it is closer to the Sun, the apparent motion of the Sun in the sky will reflect this - for some time, the change of angle of the line-of-sight towards the Sun caused by the orbital motion is "faster" than that caused by the planet's rotation around its axis. At the time of closest approach to the Sun, this effect will cause the Sun to move temporarily backwards(!) in the sky . Then it resumes its normal westward motion, and as Mercury moves farther from the Sun, the solar disk begins to shrink in size until sunset, 88 Earth days after sunrise. What a day! And then, for a period lasting 88 Earth days, it is night for you. On the Earth, things are not so complicated. We don't spin one and a half times per year around the Earth's axis - we spin much faster in relative terms, just over 365 times per year. That is why the time interval between two successive noons (when the Sun is highest in our terrestrial sky) is only 23 hours and 56 minutes, and not 176 days!